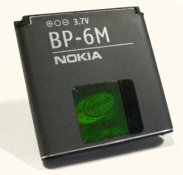 A rechargeable lithium polymer battery is common feature of mobile phone such as Nokia mobile phone battery. A rechargeable batteries which have technologically evolved from lithium-ion batteries. Ultimately, the lithium-salt electrolyte is not held in an organic solvent as in the lithium-ion design, but in a solid polymer composite such as polyethylene oxide or polyacrylonitrile. The advantages of Li-poly over the lithium-ion design include lower cost manufacturing and being more robust to physical damage. Now, researchers at the Fraunhofer Institute for Silicate Research ISC in Wurzburg, Germany, have developed a novel lithium-ion battery that would prove to be more safer for cell phones and other electronic devices. Lithium-ion batteries supply the power for cell phones and PDAs, and larger devices such as laptops, cordless screwdrivers and lawnmowers are becoming increasingly dependent on this power source. The advantage of these power storage devices lies in their high energy density and voltage (up to four volts).